Popular destinations include central Vientiane province, the World Heritage Site of Luang Prabang in Luang Prabang province, and Luang Namtha province. The northern provinces were popular because of their stunning waterfalls, caves, old temples and natural scenery, Khamsouk said. Visitor numbers were higher because of the many new promotional programmes and activities on offer during Visit Laos Year. The manager said most of his clients were European. A representative of Green Discovery in Vientiane province, Ketsoulinya Vannaphone, also said he had taken more reservations for package tours. 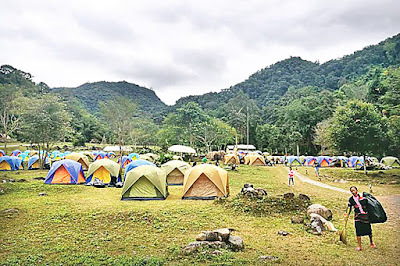 Most people wanted to go to Vangvieng district – a well-known tourist destination in the province – to enjoy its adventure activities such as kayaking, tubing, speed boating, and zip lining, he said. In comparison, the manager of Laos Keywords travel company in Champassak province, Naray Xaypasong, said that from the end of last year until the present the number of people booking trips to Champassak was down compared to 2016. The decline could be because of economic uncertainties in Laos and other countries, or because some tour operators had put their prices up. The manager of Champassak Travel Company, Oudom Phakaysone, also said the number of bookings for trips to the province had declined compared to previous years. He thought this could be because of the small number of tourist attractions and the fact that there were no new developments in the province, while word might have got around about the high price of food. The decline in package tour bookings by the two latter tour operators comes amid a drop in foreign tourist arrivals since 2016. In 2016 Laos received just over 4.23 million foreign visitors, a drop of 10 per cent compared to 2015. During the first nine months of 2017, the number of foreign tourist arrivals was recorded at just 2.88 million people, a drop of 9.1 per cent compared to the same period in 2016. In the hope of attracting more visitors, the government has launched Visit Laos Year 2018 with a number of promotional activities to showcase Laos’ cultural, historical and natural charms and the cultures and customs of its 49 ethnic groups. The government hopes the initiative will bring at least 5 million foreign visitors to Laos in 2018.